So, two things you need to know up front before we get going here. First: Brandon is out of town. Still. So it is my job as remaining parent to take millions of photos + videos of what all Huck is up to and then text them to Brandon so he can reply back at me how cute our kid is, and then sometimes we get a video back of what all he's been up to. For example, last night we got to watch Brandon ride the zipline his parents built in the back yard for their grandkids, and tonight Brandon took Huck on a grand tour of the hotel pool. So. Boys. The point being, you know how sometimes you go for days without taking pictures of things on your phone? These are not those times. 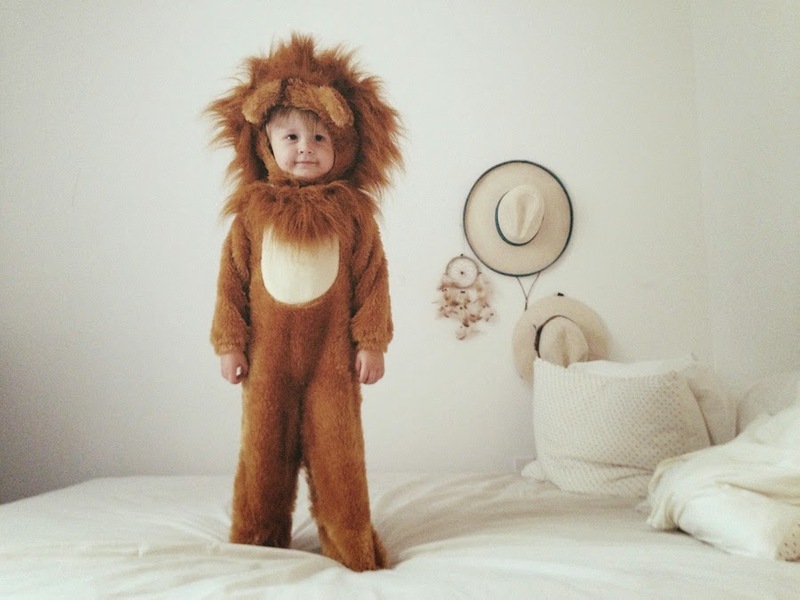 Second: Huck is the proud owner of a magical lion Halloween costume that, seriously, miraculously, has fit him perfectly for three years running. It defies all the laws of physics, and for that I am grateful. Obviously. Because, well look at him. 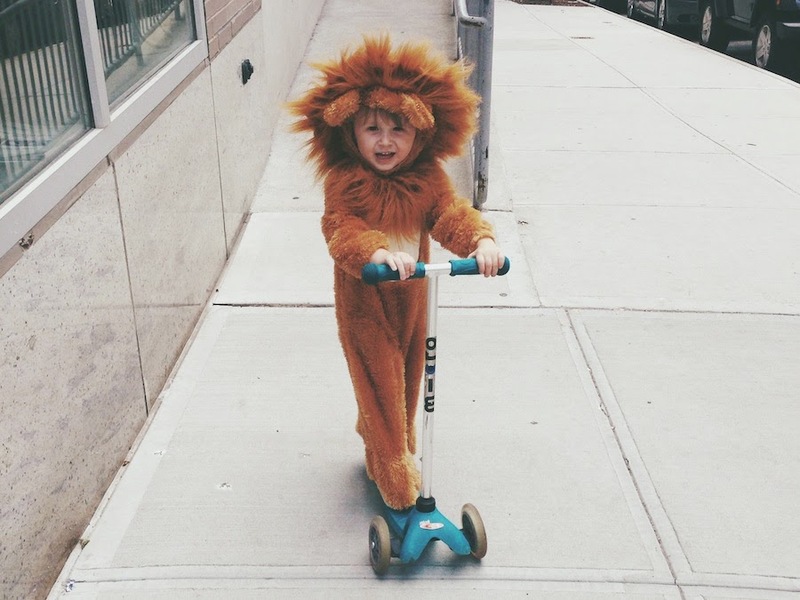 Locals, lest you worried you'd hallucinated a lion riding a scooter through the Upper West Side this afternoon, fear not. That was us. And now, here is what all we did. Next we went to the bank to deposit some checks. Exciting stuff, yes? Next we discussed playground options. These debates can go on for hours. So first we decided to get something to eat. We like to take obnoxious photos of ourselves in the mirror outside of the crepe place while we wait for our crepes, for purposes of posterity and stuff. Huck's favorite is the ham + gruyere if you want to know. And he is still pretty good at waiting patiently. And then I was like, "Okay Huck. But this is not happening at the playground, it is time to change your clothes." 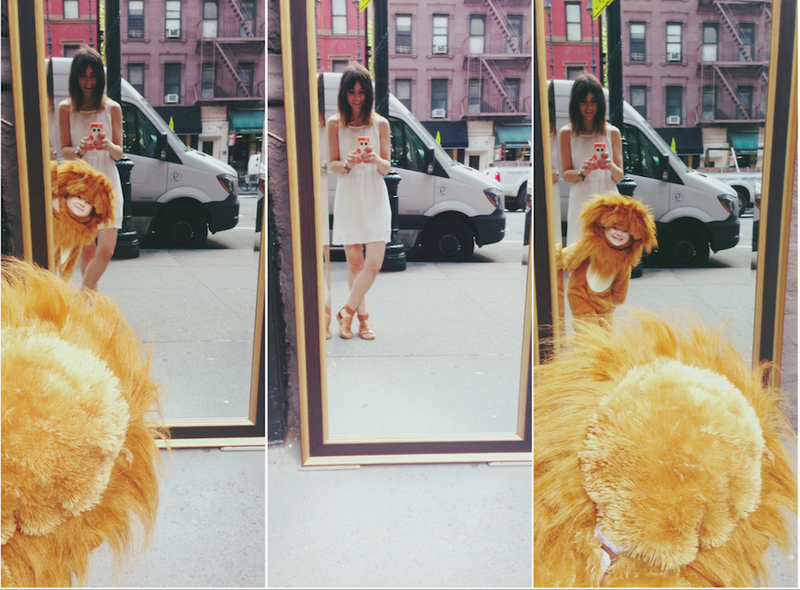 There is only so far you can take a lion costume on an 80-degree day after all. He was okay with it at that point. *Not pictured: The two hours I spent playing Pet Rescue while Huck ran around the playground alternating between the splash pad and the sand box. Hashtag, mud. **Totally Related in a Magical Way: THIS. I want that costume!!! So good! He is awesome!! And also a little crazy for wearing that when it's 80 degrees, but I really don't think kids realize when they're hot as long as theyre having fun! good lord. 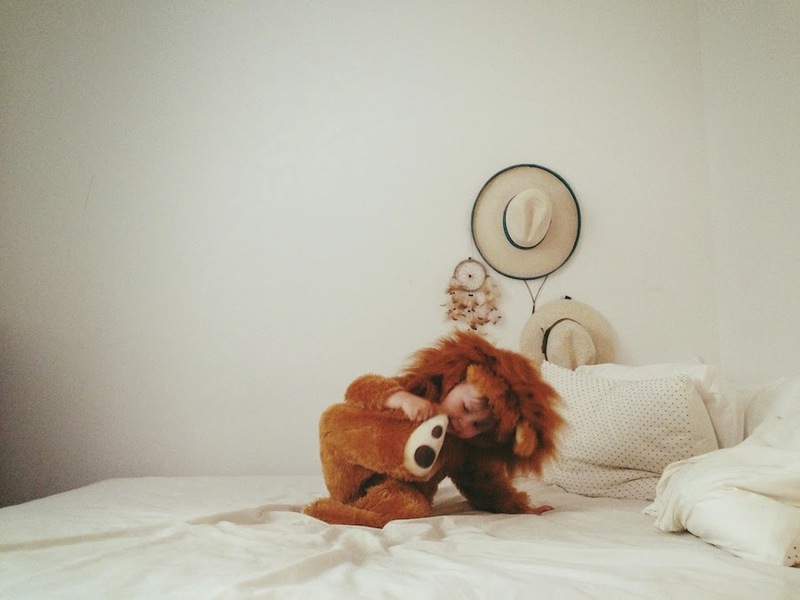 this was completely adorable, and as if my ovaries weren't already doin' their "i need a baby" thing, this did me in. My daughter was obsessed with her dinosaur costume, FOR YEARS. I think age 3 until 7. There were times where I'd have to pick my battles and just let her wear it. Is that a tattoo on the back of your forearm?! OK, this is the best and the cutest post I've seen anywhere in a long time! 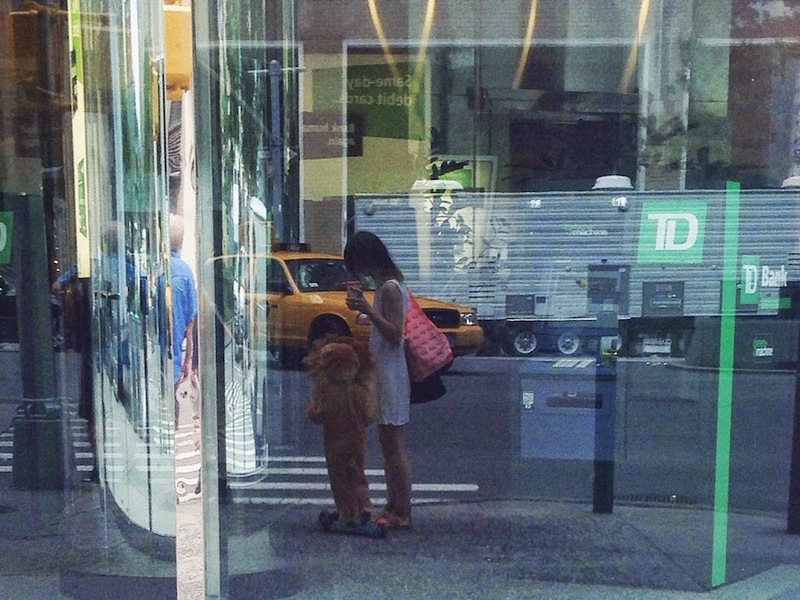 LOVE it and love the fact that you took this costume out on a walk! oh my gosh. the cutest!! That is just the cutest damn thing I've ever seen. I love that you took him out in it. Sometimes I still wish I could dress silly in public. This is great, I love this post. You're looking beautiful in that last picture with your boy. Love the hair, dress, dark eyelashes, love it all. What a fantastic way to spend the day together! Great job on letting Huck express himself at a lion. He is absolutely adorable. 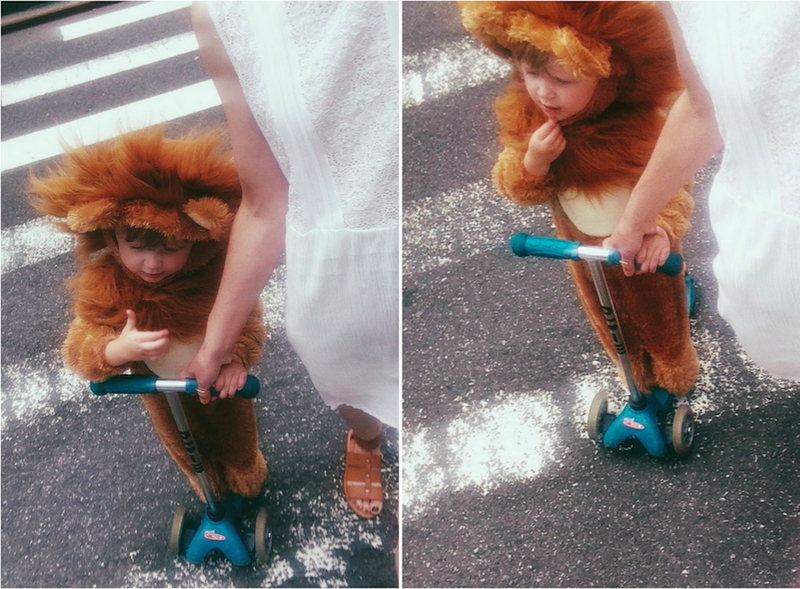 I have never been more jealous of UWS-ers than I am right now--they got to S E E this lion in all of the scooting glory! Oh man...so good! I'm dying over this. I am so happy that we've gotten to enjoy this for 3 years!! 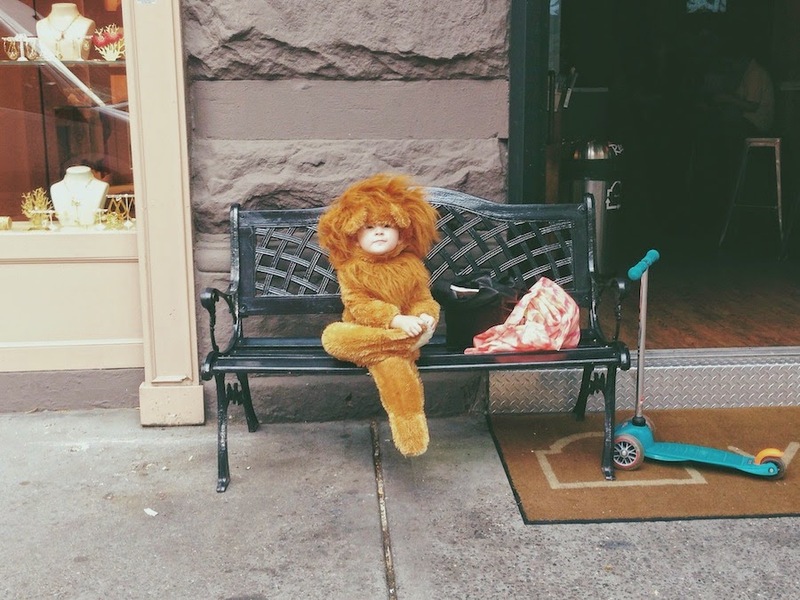 It's officially my new dream to be followed by a human lion whilst on my errands. And it's at the top of my priorities. 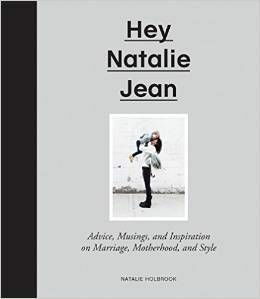 her writing and style- i think you guys are kindereds! Hahahaha, his one-foot-forward pose in front of the mirror is killing me. What a character. 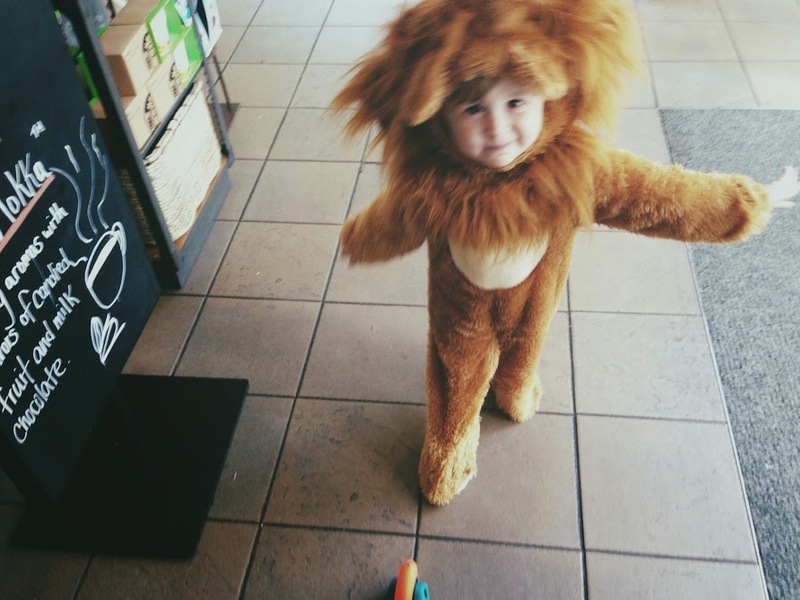 Did anyone stop you to ask about the ferocious lion following you around? 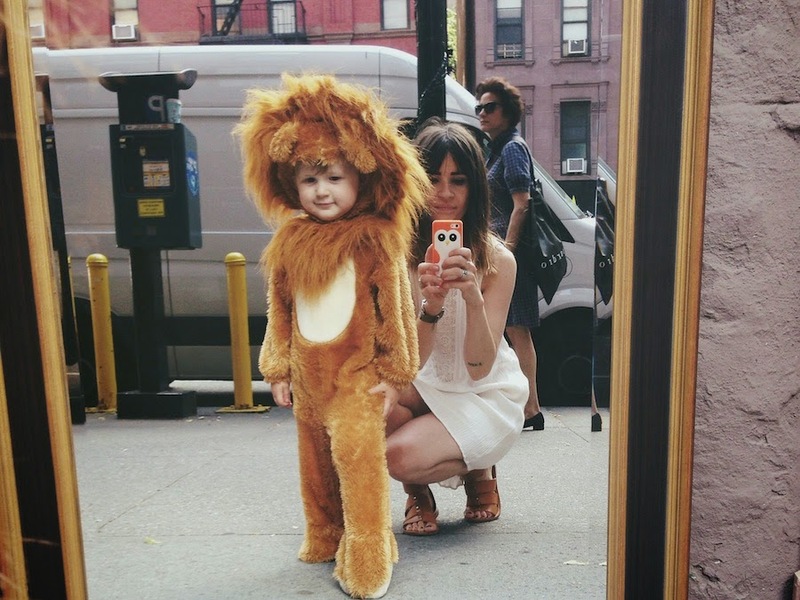 This is reminiscent of a post from your archives, about the subway lion- a random little boy in a lion costume, before you were even pregnant with Huck. This must have been one of those glimpses into motherhood that you ached for. Now you have it. What a beautiful thing! Whatever you might be like in your private life- your changing beliefs, worldview, and Heaven forbid, sensitivity when people say nasty things about you, just know that you have endeared yourself to us with your honesty and your words. Please don't ever lose that. Don't let haters dull that brightness in you. Just keep doing what you do. A quote I heard recently fits well: "There are two ways to dehumamize someone: by dismissing them, and by idolizing them". C. Jane once gave me the best advice from a table at the Orem library. She said that writers must keep giving themselves to people. Wise words from a wise lady, right? But seriously. You're awesome. Keep it up, girlfriend. Really really loved this post and um..can you be my mom?? Er nevermind I'm 28, would that be weird? But seriously you're such a good mom and you make me silly excited about maybe one day being a mom too. Also love your blog and style btw. My twin sister and i actually compliment eachother's outfit and accessory choices with "oh my gosh, so cute, that's sooo natalie" :) keep rockin sister! love this! i laughed really hard. rawr! Okay, Best Mom Ever award goes to you. 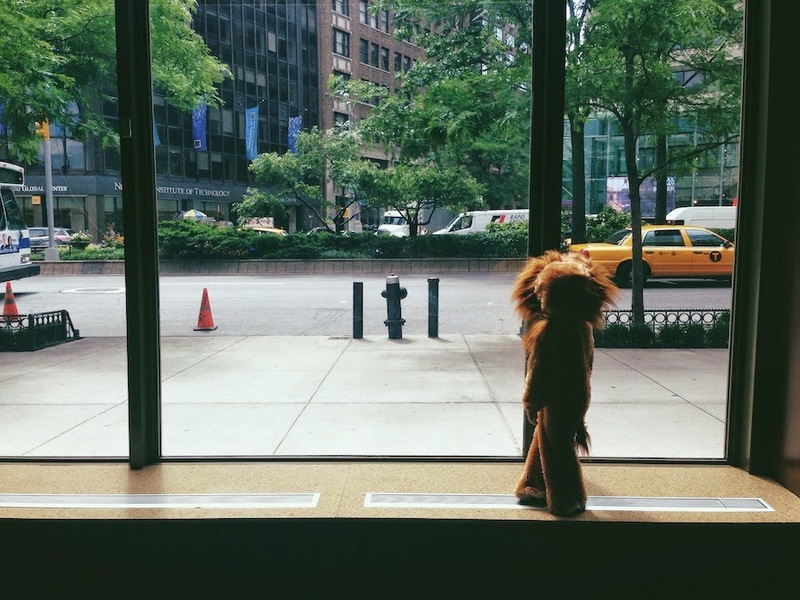 These photos are amaaaaaazing and I love you for letting him be a lion out in the city :) I insist that you print and frame these photos immediately (and maybe submit one to Humans Of New York?). These should definitely be added to the pile of Photos-To-Show-Huck's-Future-Lady, Include-In-College-Graduation-Announcements, and Show-Off-At-His-Wedding. OKAY, this is actually the greatest and also the cutest publish I have observed any place in quite a long time! Like it as well as adore the truth that a person required this particular outfit on the stroll! hahhaahh this is the cutest post ever!! 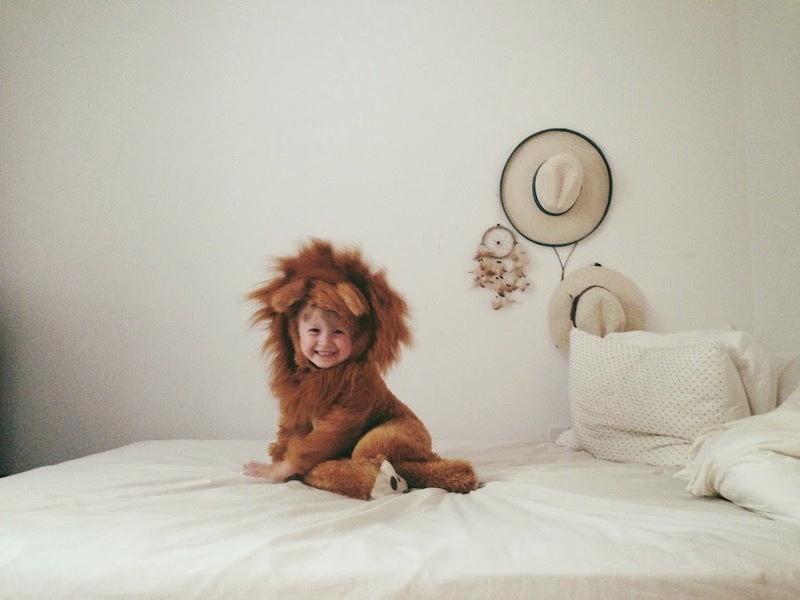 love that little lion!! This is the cutest post EVER.